Deception has never been in short supply when it comes to politicians and the media. They either bend the truth or outright lie, all in an effort to be able to say they hold the moral high ground. The freshman class of Congress seem to be better at it than their predecessors. 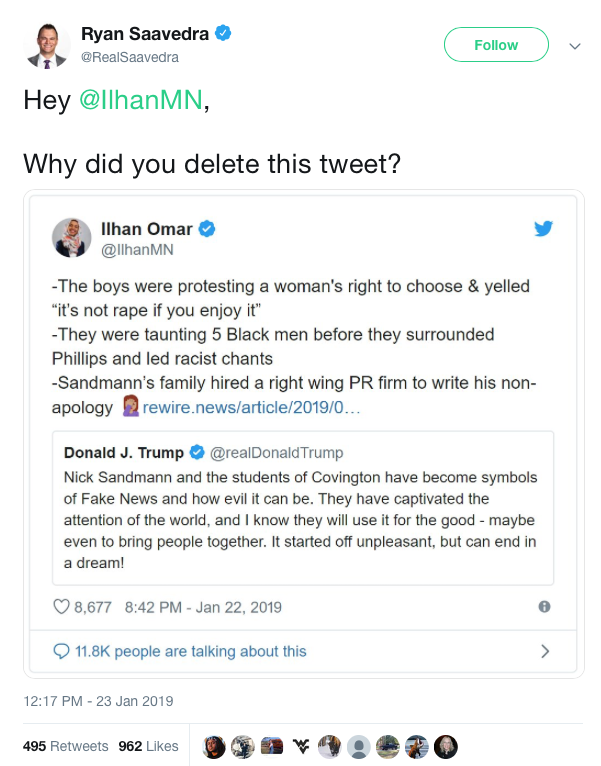 Rep. Ilhan Omar (D-Minn.) sent out a tweet Tuesday evening responding to President Donald Trump’s tweet attempting to put a positive spin on the media witch hunt of the Covington Kids. 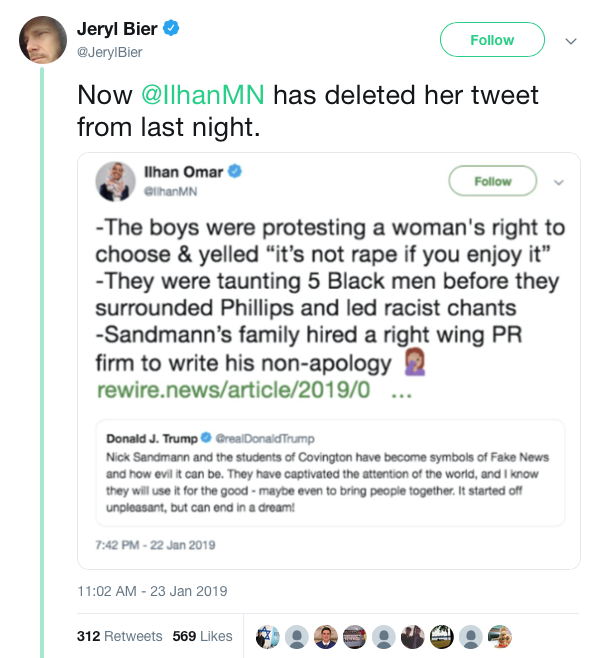 In her response, Omar raised three points that have all seemingly been proven as false narratives. 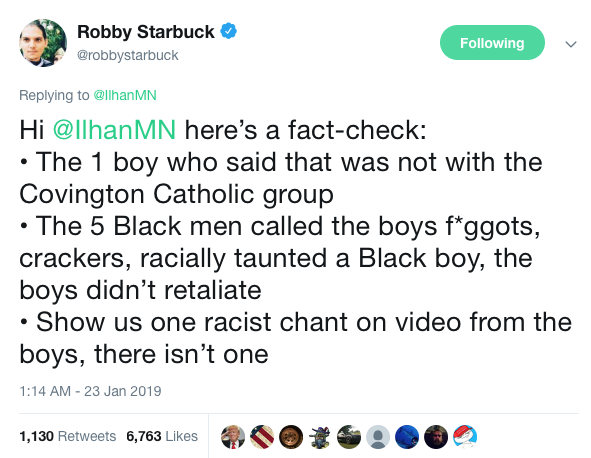 I watched the almost two-hour video of the confrontation between the Covington Kids, Native American activist Nathan Phillips and racist hate group, the Black Hebrew Israelites. Nowhere in that video could a rational human being construe the Covington Kids actions as “taunting.” Even if the kids had been responding to the Black Hebrew Israelites with any level of animus, would standing up for yourself be justified considering the hate group’s actions of repeatedly hurling racist and homophobic epithets towards the teenagers? Maybe, maybe not. One thing is for sure, Omar's tweet is flat out irresponsible for a sitting member of Congress. 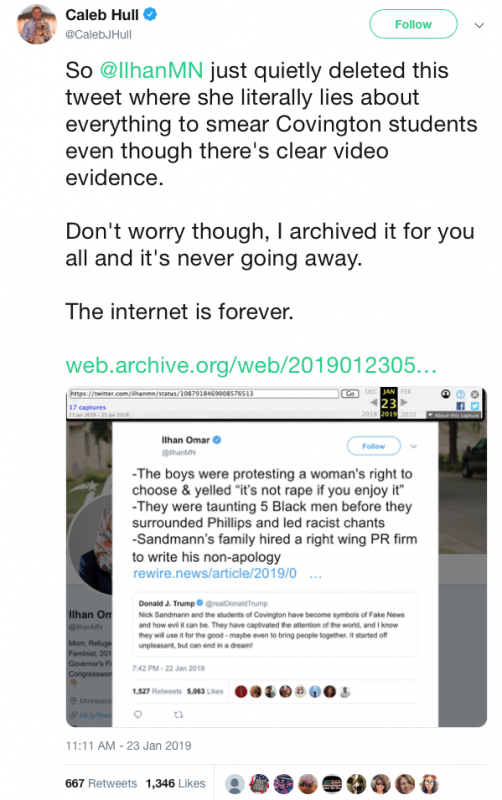 Omar essentially blatantly lied, because her tweet came after the truth was uncovered and somewhat acknowledged by a media that misreported the story in the first place. Karma always comes for liars and deceivers. This time, Twitter provided the Omar with her just desserts.